Try not to eat the entire pan warm and gooey out of the oven. Bring sugar, butter, oil, and water to a boil. Add chips and stir till melted. Add eggs and vanilla and stir till smooth. Stir in dry ingredients and nuts. Pour into a greased 8" pan. Bake at 325 for about 25 minutes. -The original recipe called for 3 Tbsp butter. 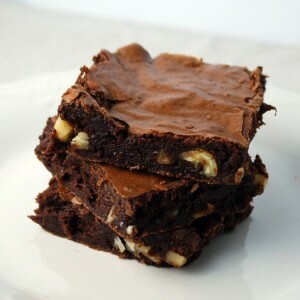 I added the 1 Tbsp oil in place of butter because oil will keep the brownies more moist at room temperature. -Make sure the chocolate mixture is cooled before you add the eggs or you will have chocolate covered scrambled eggs. And that is just plain gross! -You could leave out the nuts, but I think they make these wonderful! -I think these would be great with chips added. Any kind: white, peanut butter, or even just chocolate. I can't wait to try it.